There’s already a market for 3-D printers—it’s just not in people’s homes. Technology analyst firm Canalys’s Joe Kempton estimates that total sales of the devices and the materials and services accompanying them hit $1.8 billion in the first half of 2015 and expects that number to top $20 billion by 2019. Two-thirds of 3-D printers are shipped to the enterprise market, which also generates a whopping 85 percent of the revenue. Everyday individuals, though, not so much. 3-D printers are expensive, technologically complex, and lack a clearly defined purpose for those who don’t consider themselves part of the maker class. ThingMaker tries to resolve all of those constraints, and does so with the imprimatur of the country’s largest toy company. That solution comes in the form of a self-contained ecosystem. Kids (or their parents) can work from an existing template or construct their own creation in the ThingMaker Design app, which relies on a simple drag and drop and 3-D visualization to show how the finished product will look (it’s sort of like an Autodesk Lite for kids). From there it’s a literal push of a button, and the ThingMaker spits out your print. “Ive seen people make entire vehicles out of parts that were originally intended to make action figures,” says Pressman, which sounds wonderful and a little bit terrifying. 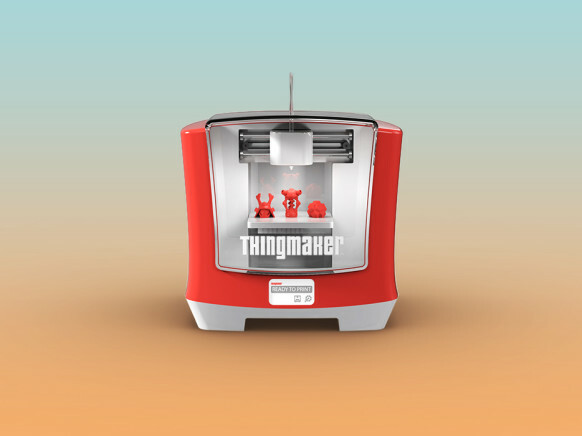 ThingMaker might not be the ultimate validation of 3-D printing, but it’s arguably the most approachable. And what other 3-D printer is going to let you make race cars out of arms and wings with the touch of a button? Exactly.